Libby on the Label: #52 Ancestors Week 40 - "Ten"
#52 Ancestors Week 40 - "Ten"
It took me a while to figure out who I wanted to post about with this week's prompt. I approached things differently and went looking for a family that I wanted to explore, hoping to find something "ten worthy" to focus on. I have many women named Eunice in one branch of my family tree, as I mentioned briefly here. The original Eunice, as far as I can tell, was Eunice Hazen (Farwell) Willard my 6th great grandmother (1736 - 1808.) The name has been passed on through every generation since, up to and including my paternal aunt. Eunice married into the prolific Willard family. I've learned a lot about my 6th great grandfather, Nathaniel Willard and his history through the Willard Family Association, but know nothing about the Hazens. When I started this, I thought that Eunice was one of 10 children. Actually there were only 8, but if I hadn't chosen the Hazens for this week's post, I would have never known! Her parents (my 7th great grandparents) were Samuel Hazen and Sarah Harriman Hazen. 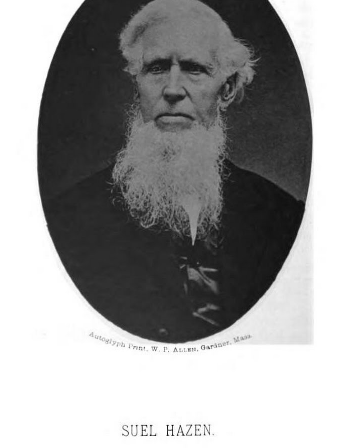 That's an autoglyph of Samuel pictured above taken from "History of the Town of Shirley, Massachusetts: From Its Early Settlement to ... "By Seth Chandler. According to The Hazen Family in America; A Genealogy Samuel Hazen (Edward2, Edward1) was born in Rowley, Massachusetts on July 20, 1698. Along with his brother John, he was among those who petitioned the General Court to be set off as the Second Parish of Rowley on May 20,1730; this territory is present day Georgetown. 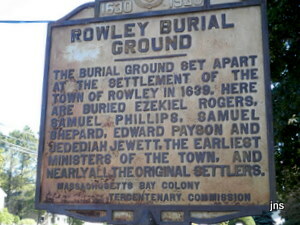 He removed from Rowley to Groton, Mass., in 1736. In 1749 he purchased a farm in what was called "Stow Leg," a strip of land soon after annexed to Shirley and forming its entire southern boundary. It is said that he lived in a log house at first. This estate was still in the possession of descendants after 1900, together with a fine two-story house built by him for his son Samuel about 1765; also the house opposite, built by his grandson, Thomas Hazen, in 1795. When Shirley was separated from Groton, Samuel Hazen was chosen one of the five selectmen and a highway surveyor in 1753. He was selectman also in 1755. He died in Shirley on September 20, 1790 and is buried in the Center Cemetery along with Sarah Harriman Hazen. Sarah Harriman was born in Rowley, Massachusetts on March 18, 1701. She was the 5th of 8 children born to Johnathan Harriman (1657-1741) and Margaret Eilthorp (Wood). Her grandfather Leonard Harriman was the first of her family to emigrate to the Colonies. His wife was also named Margaret, with no known last name, Many sources have her listed as Margaret Palmer. According the Harriman Family Association and their extensive research, not so. Leonard and Margaret are probably buried in the Rowley Burial Ground, where the Association erected a memorial stone in 1992. There are few gravestones from those early days.The HFA’s stone records that he was born in Rowley, Yorkshire, England, but they now know Leonard Harriman was most probably from Uldale, Cumbria, England. This week I scratched the surface of a whole new (to me) branch of the tree. Because these families were some of the original settlers of Massachusetts, much of their history has been preserved and researched by many genealogists and descendants. Feeling very lucky because it is relatively easy to trace my ancestors. I want to post what I have here for posterity and as a starting point for future searches.